In 1560 a confederacy of major daimyo, led by Imagawa Yoshimoto, approached the Imperial capital. In their way was the minor daimyo, Oda Nobunaga, whose father had been killed and clan holdings significantly reduced in previous battles with the Imagawa. 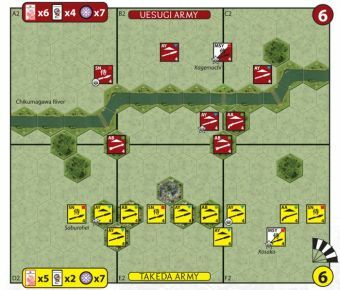 The 40, 000 strong Imagawa army divided to assault and successfully capture the several castles guarding the border of Oda territories. Learning that Yoshimoto was camped with his detached force of 5,000 in a wooded gorge near the village of Dengakuhazama, Nobunaga advanced with his smaller force of 1, 500 to meet him, against the advice of his retainers, reportedly saying, “Do you really want to spend your years praying for long life? We were born in order to die! Whoever is with me, come to the battlefield tomorrow morning. Whoever is not, just stay here and watch me win it!" 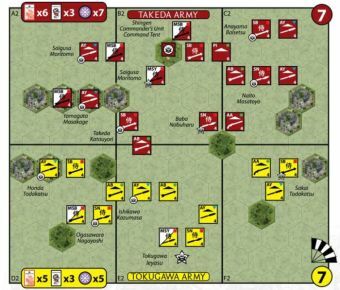 A huge thunderstorm allowed the Oda forces to approach Dengakuhazama undetected, and when the rain abated, launch a surprise attack on the Imagawa, who were caught completely unaware, drinking and dancing to celebrate their recent victories. 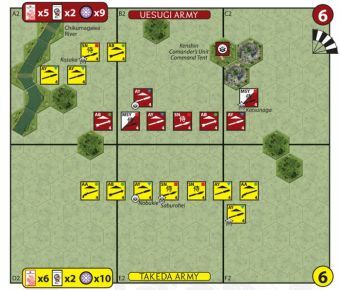 Emerging from his command tent to quieten what he thought was the boisterous behaviour of his own troops, Yoshimoto found his camp overrun by the enemy. He deflected the spear thrust of Hattori Koheita but was beheaded by Mori Shinsuke. 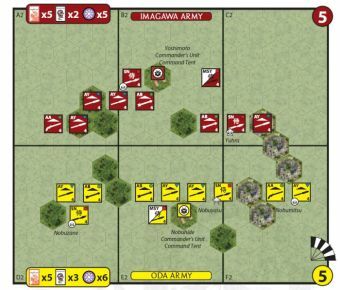 With their commander’s death, the Imagawa forces broke. 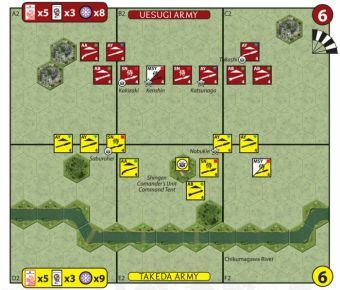 Okehazama was an epoch-defining battle. 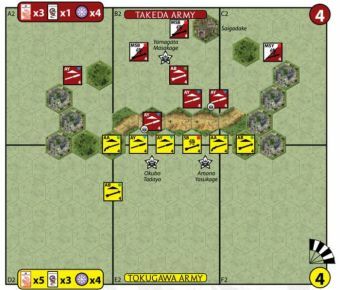 A number of important daimyo, including Tokugawa Ieyasu, defected to Oda Nobunaga, starting him on the journey that would make him the preeminent warlord of the Sengoku Jidai and initiating the long train of events which would eventually lead to Sekigahara and the unification of Japan. 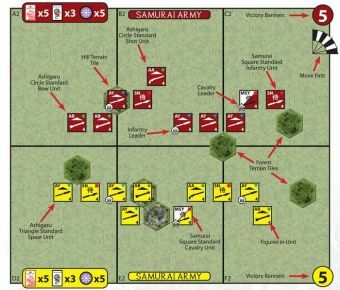 * The Imagawa Command Tent hex is worth 3 Victory Banners to the Oda player, as per the Command Unit rules on the C&C reference sheet. In the aftermath of the heavy rains, bowstrings and powder are wet. 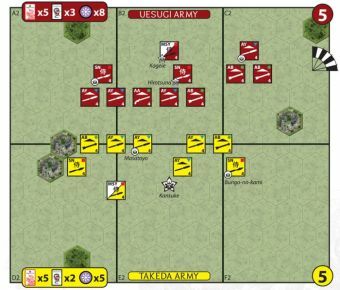 Ordered Ashigaru Arquebus and Ashigaru Bow units must expend one H&F token to conduct ranged attacks. 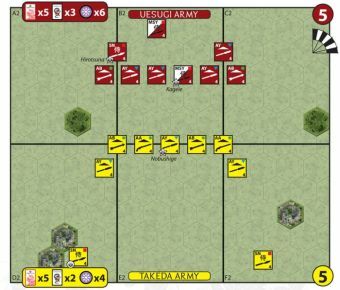 Once per game, when an ordered unit with Mori Shinsuke attached engages in close combat with Imagawa Yoshimoto’s command tent/unit, the Oda player may initiate a Personal Challenge as if he possessed the Dragon card of the same name. This counts as a Dragon card play in all respects for the Oda player. Note that Yoshimoto is a commander, outranking Shinsuke and therefore gaining 1 die in the duel. All hill terrain tiles are impassable. Players will need to proxy hill tiles to supplement those available in the base game. The building terrain tile on the baseline is Dengakuhazama Village.